Continuing on from my other “parts of a..” posts such as parts of a door frame and parts of a window, this time we are looking at parts of a staircase. Most of you probably use one staircase or more in a typical day but have you ever wondered what the individual parts are called, well this blog post will hopefully explain them for you. Staircases can be made from all sorts of materials, most commonly is wood, and depending on how elaborate you want the stairs can be made from expensive hardwoods and be either varnished of waxed to show the beauty of the wood off. The handrail is the part of the staircase that you hold onto as you go up and down the stairs. The handrail is to give stability and support as you use the stairs. The handrail can go upto the newel post or sit on top if the newel post to form a continuous handrail, this may have a scrolling handrail at the end, know as a Monkey tail. 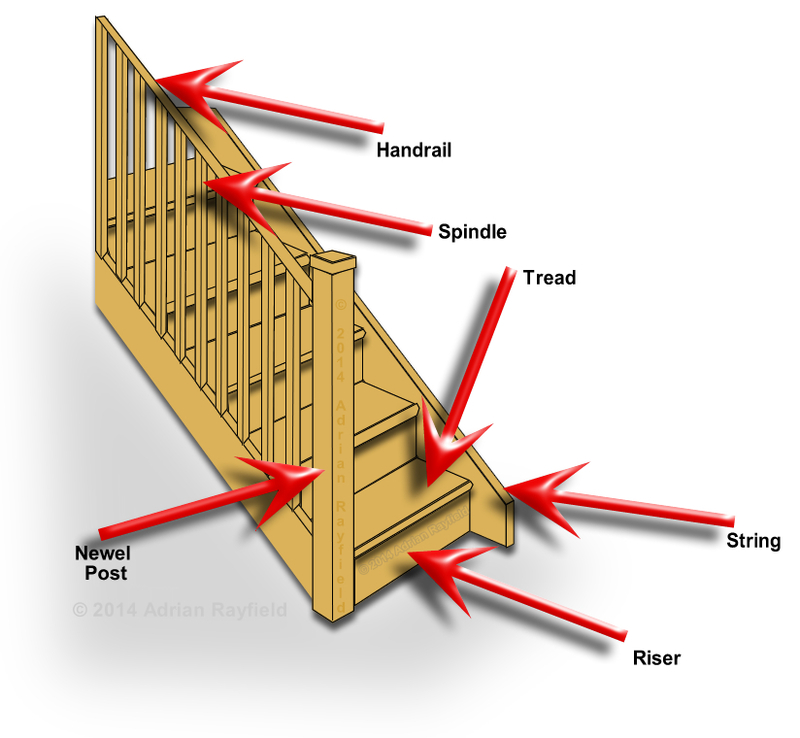 Spindles can either be plain or decorative, they infill between the baserail and the handrail, they have to be a set distance apart and no more than 99mm to avoid a childs head passing through between spindles. This gap is in line with UK building regulations. Spindles are also known as Baluster and are part of the balustrade which consists of handrail, baserail, spindles and newel posts. The baserail is a rail allowing the spindles to be fixed into with spacers fitting into the rail to space to spindles correctly. The baserail sits on top of the stringer. The top rail is the same as a baserail but sits under the handrail. The stair tread, is as the name suggests the part you tread on as you ascend and descend the staircase. 220mm is the minimum tread depth for UK domestic staircases. The riser is the vertical section that makes up the front of the step, the minimum depth for the UK domestic staircase is 220mm. You can have open risers, this is where you have a small or no riser and gives and open and airy feel. The maximum gap allowed for this gap is 100mm. The step is the tread and riser together making the ‘step’. The string are a structural part of the staircase that hold the tread and the riser (step). Typically there is a string on either side of the staircase, but not in every case. Strings or stringers can be ‘closed’ or ‘cut’. Closed stringers are the cheapest option and plainest in there look, the stringers encloses the tread and riser. Cut stringers are cut to follow the line of the tread and riser, allowing the tread and riser to be seen. The wall string is the string that sits flush against a wall. The slope, pitch or rake is the angle of the stairs, 42° is the UK rake angle. 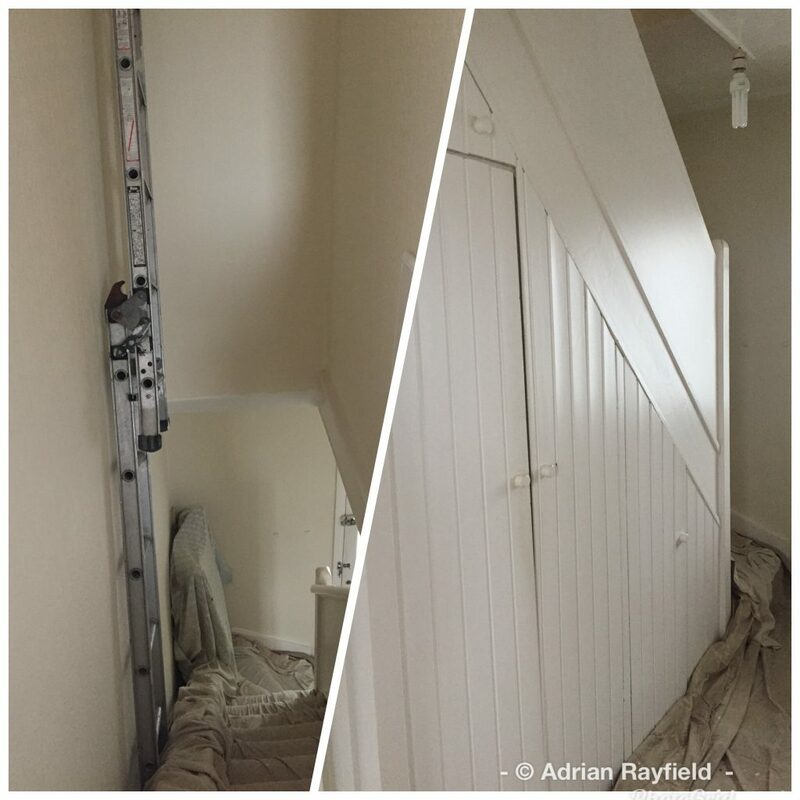 Landings are the area at the top of bottom of the stairs, although you can get half and quarter landings that allow the staircase to change direction and take up less space than a traditional straight staircase. The newel is the large posts at the top and bottom of the stairs. 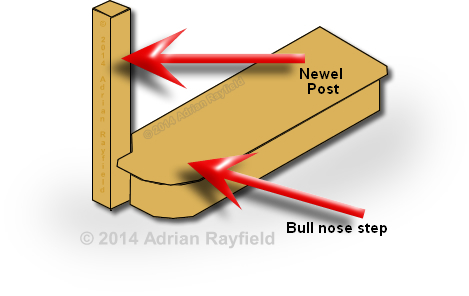 The newel posts has the string and the handrail jointed into it. The newel can be plain or decorative, to match the spindles for example. This is typically the bottom step that has a rounded off end, a bullnose. The bullnose step start beyond the bottom newel post and wraps around the newel. Sometimes if the handrail sits on top of the newel and has a monkey tail on the end, the spindles sit on the step. You can also get a shaped step known as a curtail step. The nosig is the rounded front edge of the tread that protrudes beyond the face of the riser.